The apartment is entirely private and you will have it all to yourselves. It occupies the whole ground floor of our house with its own entrance. 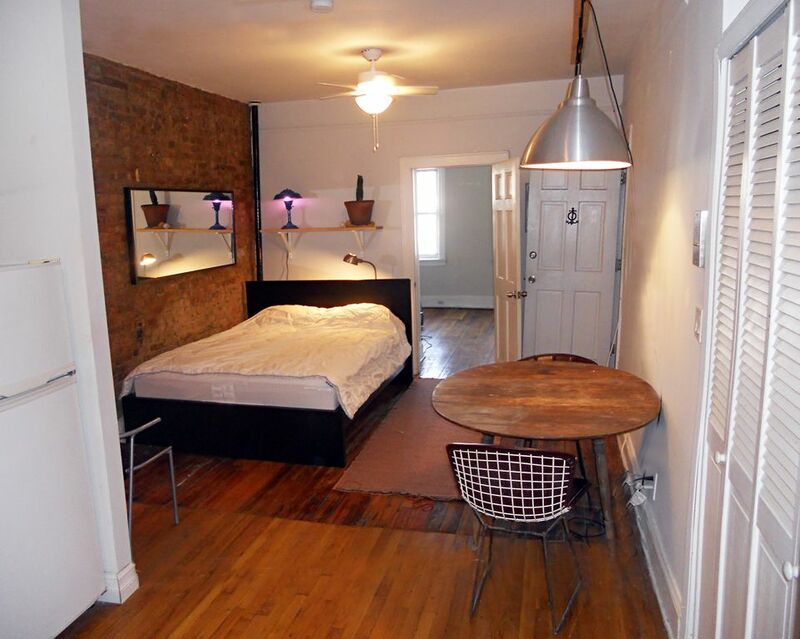 Hardwood floors, exposed brick, and minutes from great restaurants and shops. There is a queen size bed in the main room in the rear. The sofa bed in the front (street) TV room pulls out to a queen bed. The two rooms are separated be a door. The entrance is through the TV room right off the street. The apartment sleeps four. Everything is a little crooked and funky in this turn-of-the-century house, which is part of the charm. You'll have a large, well stocked kitchen for shopping at Fairway Market down the street, with a dishwasher and microwave. There is also a large garden in the back, with a huge two story tree house for kids, although we built it adult sized so you can hang out on the top level during summer nights and enjoy a drink. There is also a cast iron table and chairs and a wicker bench seat if you prefer to stay on terra firma! Our home is located at the northern end of main street Van Brunt, the 'residustrial' stretch. The block is entirely residential on our side of the street and is surrounded by a manufacturing/commercial district with businesses as varied as import/export companies, glass shops and a the best coffee roaster in Brooklyn. One block south of us is where the 'residential' stretch begins and you'll find all the great bars, restaurants and shopping. Transportation in Red Hook is provided by a new ferry service two blocks from the house which takes you to Manhattan in 20 minutes! It also serves other neighborhoods on the Brooklyn waterfront for you to explore. And it's fun with a great view of the City! The B61 bus (stop across the street from our house) also takes you to all major subway lines in downtown Brooklyn in 10-15 minutes. Total trip with bus to subway into Manhattan is approximately 40 minutes. The NYC Ferry is two blocks behind our house and takes you up and down the East River to various points in Brooklyn and Pier 11 in Manhattan for $2.75 each way. It's a pleasant 20 walk through scenic Carroll Gardens to the F and G trains. Car services are inexpensive and plentiful, and provide an economic way to get around. The wildly popular Citi Bike bike share rental program has several pickup/dropoff locations in Red Hook for treks into the City across the Brooklyn Bridge where you can drop them off at any of hundreds of locations and jump on the subway. The Brooklyn Greenway bike path runs through Red Hook. The Greenway starts in Greenpoint, down through the Brooklyn Bridge Park and ends in Sunset Park. Farther south you can pick up the bike path to Coney Island under the Verrazano Bridge. Red Hook is a vibrant, ever-changing neighborhood that has the quiet, small town quality of fishing village. We are surrounded on three sides by water which give the area a unique and beautiful light. This area is populated with many artists and craftspeople, with several art galleries. There are many top notch restaurants that are some of the best in Brooklyn. Red Hook has become a foodie paradise! There are also some great, funky bars including Bait and Tackle, and the legendary Sunny's, not to be missed. Fairway Market, eight blocks away, is one of the best supermarkets in the City, with local and rare products, excellent produce, and even dry aged meat, as well as a cafe with stupendous views of New York Harbor and the Statue of Liberty. There are several piers which are excellent for sunset viewing or watching weekly movies on an outdoor screen. We are primarily a neighborhood with an industrial and maritime past, and there are many old buildings and warehouses that date to the Civil War, making it a fun and educational place to explore on foot. The neighborhood is very safe, even late at night. Because it is lightly populated, the streets can sometimes seems empty, but that's part of what draws people here - the quiet character. In over 10 years here we have never had any sort of problem, nor have our neighbors, and there are many kids in the neighborhood. During the Revolutionary War, the 'Battle of Brooklyn' was fought at Fort Defiance on the waterfront, and later Al Capone was born here and roamed the streets before moving to Chicago to start his infamous career. Backyard garden and tree house, cable TV and wireless internet. The local laundromat is one block away, although we can do a small load for you in moderation. Pete, Sharon, and Gus live upstairs and are always available to answer questions, and provide recommendations for places and restaurants to visit in hip, artistic Red Hook, or give transportation options. If we're around (Pete typically works from home), we'd be more than happy to drive you to the subway. Peter owns two clothing labels, Live Poultry Designs, and Grace Parkour, and silkscreens images of lesser know NYC landmarks on clothing. Tourist shirts for locals! The Red Hook 'R' sign is one of our most popular. He is also a painter and has shown his work all over New York City and elsewhere. Sharon works at Interfaith Medical Center in as a therapist. She is an avid sci-fi geek in her spare time. Our son Gus, is in the 9th grade and loves parkour, guitar, drawing, and of course, video games. Transportation in Red Hook is provided by the B61 bus (stop across the street from our house) which takes you to all major subway lines in 10-15 minutes. You can track exactly when the next bus will arrive with this link: (website hidden) There is the NYC Ferry two blocks behind our house that takes you up and down Brooklyn and over to Pier 11 in Manhattan for $2.75 per trip. A scenic and fun way to get to the City. It's also a pleasant 20 walk through scenic Carroll Gardens to the F and G trains. The IKEA nearby on the waterfront also provides a ferry service to lower Manhattan. http://(email hidden)/tours/ikea The wildly popular Citi Bike bike share rental program has several pickup/dropoff locations in Red Hook for treks into the City across the Brooklyn Bridge where you can drop them off at any of hundreds of locations and jump on the subway. The Brooklyn Greenway bike path runs through Red Hook. The Greenway starts in Greenpoint, down through the Brooklyn Bridge Park and ends in Sunset Park. Farther south you can pick up the bike path to Coney Island under the Verrazano Bridge. Car services are inexpensive and plentiful, and provide an economic way to get around. You can also download the Uber app for other car service options. It’s a great way to get a car quickly. The time to get to Manhattan if you take the bus to the subway is roughly 45 minutes to 1 hour, depending on which subway line you are traveling to. The apartment is not fancy but very comfortable and convenient. You can be in Wall Street in half an hour; it takes just 7 min walk to the Ferry station, and 23 min of a very beautiful ride enjoying the view of Manhattan. The ferry is not crowded and there are boats every half an hour in the morning and in the evenings. The down side is a very small bathroom. There is plenty of parking space in the area. The kids loved the tree house. Thanks for staying with us and we're so glad your kids liked the treehouse! The accommodation was warm, clean, cozy, comfortable and exactly what we were looking for. We were looking for an authentic place to stay while we explored NYC and the surrounds. Red Hook was an awesome place with a village feel to it. Our accommodation was perfect and exactly what we were looking for. Hassle free and close to loads of transport options. Our favourite was the ferry over to wall street pier....though walking across brooklyn bridge was hard to beat as well. Definitely look at this place if your keen on being close to NYC. It's nice to look back at the city every day. We (family of 4) stayed 5 nights at this VRBO in July 2018 to visit my sister who lives in Red Hook/Carrol Gardens. It was perfect! Very clean with all the amenities you need (iron, ironing board, kitchen supplies, towels, etc). Comfortable bed and linens. The backyard was a lovely bonus and my kids loved the tree house! The neighborhood is funky and industrial. Coffee shops and restaurants in walking distance. Noise from trucks on the street did not bother us at all - and just exactly what you'd expect from a city apartment. Peter was great! Super responsive and helpful. When there was a small leak in the bathroom sink plumbing Peter repaired it the same day. We will definitely stay here again the next time we visit Brooklyn. It was lovely having Donnieanne and her family stay with us. They were very quiet and respectful. They left our apartment neat and clean. We recommend them to AirBnB hosts. 5 Stars! Charming flat in a charming environment. Very conveniently located in charming Red Hook. Public transportation was absolutely excellent with the B61 bus line opposite the house taking you to connections in Brooklyn and Manhattan. I loved the cosy little garden with the tree-house. The landlords were very friendly and considerate. It's a phantastic place to stay when you want to explore New York. It was a delight having Edda and her friendly family stay with us. We could tell they were taken with Brooklyn so we were happy to be able to provide for them. My daughter and I wanted to visit NYC and get a more "local" experience. This was a great place to do that. We loved the kitchen and the easy access to local stores and public transportation. The noise from the buses was a little much at first, but we quickly got used to it and made it part of our experience. We had a wonderful time and are very thankful for the opportunity to visit and have a classic New York area townhouse experience. It was great having Linda and her daughter stay with us. They were guiet and considerate; we hardly heard a peep! Communication was clear and timely, and they left the apartment immaculate. We recommend them as guests to other hosts wholeheartedly. Loved having Michael and his guests stay with us. We definitely recommended them to other VRBO/Home Away hosts! 5 stars!